Northern Hospital of Surry County will begin its $22-million Surgical Services Relocation Project in January. 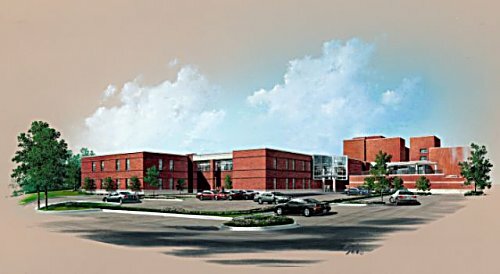 A 58,000-square-foot addition will go up at the south end of the hospital’s main campus on Rockford Street in Mount Airy. The building will be the future home of Inpatient and Outpatient Surgery, Day Surgery, GI Endoscopy, Pre-Admission Testing, Anesthesia, the Post-Anesthesia Care Unit, Central Sterile Supply, a mobile technology dock, and a new public lobby and waiting space. Associated parking and site improvements will adjoin the building. Two and one-half years in the making, this project is to be completed by the fall of 2009. The state-of-the-art digital operating room suites will incorporate the latest in medical advancements and provide the surgeons and staff with tools needed to serve the community and surrounding areas for years to come, according to CEO William B. “Bill” James. The new Surgical Services building has been designed from the ground up from a patient and family member’s perspective starting with a convenient, level, new parking area. The distances between outpatient registration, pre-admission testing and the surgical waiting area will be shorter, making it easier for patients and family members to navigate through the new area. To ease the stress associated with waiting for a family member having surgery, a much larger waiting area has been designed with additional seating to make the family’s wait more pleasant. Two consultation rooms will be available for the surgeon to privately discuss the patient’s surgical outcome with the family. Volunteers and hospital employees at the waiting room desk will assist families, answer questions, or simply listen and talk with family members to ease their anxiety. Close to 20 local and regional contractors will be involved in the work, all coordinated by the hospital’s construction manager, John S. Clark Company of Mount Airy. Wilkerson Associates Architects from Charlotte have handled the design work.